The awareness that Christmas is less than 5 weeks away startled me this week. The calendar is already filling with celebrations big and small. Feasting is a traditional part of celebrating Christ's birth, and sharing with others. This year, we are hosting a gathering of work colleagues on the 15th of December and I'm planning ahead. It will be an Appetizer and Wine evening. My lists are made and this past weekend, I began cooking a few things ahead. Some items will be purchased, but I like to make as much as I can. When I posted a photo of the empanadas on Instagram, I was asked for the recipe and for other make-ahead savoury items. I like to bake, not just sweets, but savoury treats to have on hand during the holidays. All of the recipes above have been tested by Yours Truly and I can vouch that they are delicious. The links will take you to my recipe blog. On another front, Saturday called for rain mixed with sun, and Tim thought he'd get the Christmas lights up during the sunny times. As it turned out, there was little rain, so he not only put up the lights, but washed the windows (hooray) and the front of the house. It all looks so great! The birds seem to like bathing even on these chilly days. It's fun to watch them splashing and fluttering. Although Saturday was good for outside work, on Sunday it rained all day. We went to see Murder on the Orient Express in the afternoon. It's a gorgeous film with stunning scenery, a luxurious set, and a struggle for justice. I loved it! I'd like to say Happy Thanksgiving to all of my American readers! Enjoy the turkey and the pie, but most of all, enjoy the blessings of family and friends. Thanks be to God! They all look so delicious, especially the stuffed mushrooms...one of my favorites! Lorrie, you have been busy baking up batches of scrumptious delicacies! I know your empanadas were a hit on Instagram this weekend, and you must have worked extra hard to get these recipes (and pics!) to us, as requested, as fast as you did, and I thank you for that! I believe Murder on the Orient Express was the very first Agatha Christie mystery I ever read! Must try to see the film and bake these beauties, since they are both recommended by you! Hi Lorrie, Your 'snacks' look so delicious. I'm not one to bake fancy appetizers (unless they're store bought) and we don't entertain a lot. The stuffed mushrooms and empanadas appeal to my tastebuds though. :) Have a good week. It is rather shocking that its so close! My favorite holiday! You are smart to get a head start for baking. I am hosting a gathering of homeschooling mom friends for a party on the 1st and then a Christmas tea on December 7th at church! Time to get busy! I love the simplicity of wine and hors d'oeuvres. A simple way to keep you out of the kitchen and enjoying your company. I have to look up the empanada recipe. My daughter brings them to us whenever she comes south, she has a great Mexican take out place near her apartment, and we crave them! I think that I will make the empanadas. I'm missing Oaxaca already because I know that I can't go until spring break. I saw the 1974 Murder on the Orient Express but this version was as visually appealing with its collection of colourful characters. My goodness, I am seeing Olivia Coleman everywhere these days. I think that she will be the character actor successor to Helen Mirren and Judy Dench. Gosh! That husband of yours looks like a teenager there! Good job done. My neighbor has created two lovely Christmas displays for her porch. I can’t seem to even think about it. I enjoyed reading more about the empanadas. Wow! I am amazed you are on top of the food. The empanadas so sound delicious, thanks for sharing. I am also impressed your husband got the lights up, windows cleaned, and front of house cleaned. Does he rent out? Ha! My shopping and cards are almost done, but any cooking and baking has barely been thought of. Copying these recipes! Especially the cheese puffs! Sound yummy. I do have the date one..... only we call it Devils on Horseback down here! ha! I lost my cookbooks and recipes in the flood a couple of months ago, so I'm constantly searching for recipes. These are a treasure. Oh yum, thanks for sharing all those great recipes. Wow! Lights and windows washed in one day. That's quite a great accomplishment. Your appetizers are making my mouth water. I'm sure they'll be a hit at your work party. I love reading mysteries so I don't know why I haven't read Murder On the Orient Express yet. Riding on the Orient Express (without the murder) is on my bucket list! Lorrie, you are so organized for your Christmas holiday party. I can't even think about Christmas until after Thanksgiving. Love the birdbath photograph! Thank you Lorrie for putting up all of the recipes, I love your appetizers for your upcoming party. The empanadas definitely caught my fancy! How wonderful that your husband got all of the Christmas tree work done and your windows cleaned all in one day, wow that's progress! Yes it is hard to believe that Christmas is only 5 weeks away! How well organised your are, Lorrie, Your recipes look and sound wonderful although we won't be hosting any parties ourselves this year I think that I will pop over and take a look at the recipes for some tasty treats for the two of us to enjoy. Planning ahead does make things easier, and your recipes sound delicious. I think Empanadas might be a little like a tiny Cornish pasty! Everything just looks so good and tasty! Need to take a look how it's made. I am inspired by the planning ahead that is going on at your house. Once our Thanksgiving has come and gone I think I'll move toward that goal. Your upcoming party sounds lovely. Your guests are in for a good time. Thank you for sharing your recipes. Yum! That all looks so delicious. I would love to see that movie, it looks so gorgeous. Happy Thanksgiving. It's not quite dinner time here, and your appetizer mosaic has me salivating - too bad I can't just 'pluck' them out of my computer! It sounds like a lovely event - enjoy! And thank you for the Thanksgiving wishes - we certainly have a lot to be thankful for this year. Good for you! And have a lovely Thanksgiving. Your Christmas snacks all look good! I can vouch for the Parmesan Coins...have made those often. We got our house lights up on Saturday as well. That is as far as I am with Christmas preparations. Christmas is really near - I haven't given it a thought yet! I should. Have a nice week Lorrie. Hi Lorrie! It looks like your preparing things to avoid the stress at the end. I'm going to be checking out your recipes. I do a bacon water chestnut appetizer, but the dates sound yummy. Thank you for your Thanksgiving wishes, my friend. 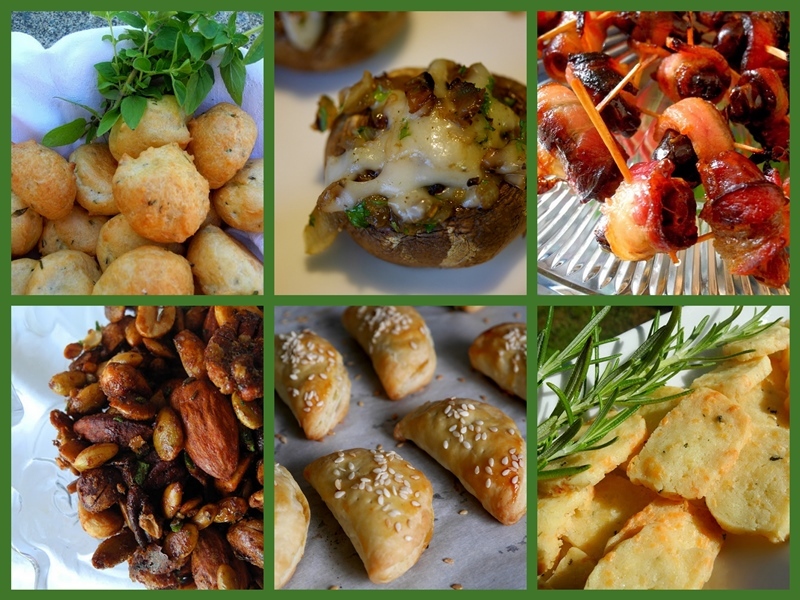 Lorrie, your wine and appetizers evening is sure to be a success with those delicious savouries on hand! I'll take a peek at those links tomorrow. On the 15th of December, there will be some very happy work colleagues around there. You are an excellent cook and baker... and photographer. Everything looks wonderful. Enjoy the preparations! What a lovely selection of tasty looking morsels - each and everyone of them looks very tempting. I went to visit the empanada recipe...that sounds delicious!! ummm,thank you for all these good recipes...and thank you for your visit with sweet words. I just love watching the birds in and around the garden. They all seem to enjoy bird baths. Lovely post and your food does look wonderful.